At a time when few people dared to traverse the forbidding Llano Estacado on the South Plains of Texas, a group of people known to history as the Comancheros made quite a living in the region. 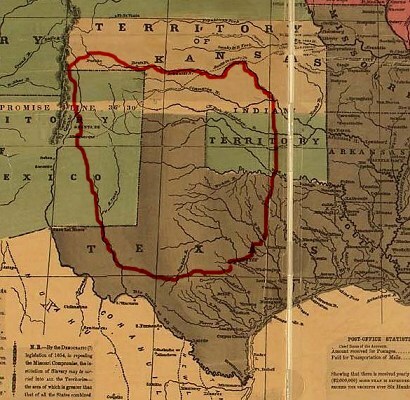 Known at the time as “Comancheria” and marked on maps as “The Great American Desert,” the Llano Estacado wasn’t a desert but hardly anyone except the Comanches and Comancheros knew this. Generally referred to as “half-breeds” by uncomprehending Anglos, the Comancheros made a living by trading with the Comanches. They were a combination of entrepreneurs and soldiers of fortune with a little explorer mixed in for good measure. The fact that their steadiest customers were the Comanche bands scattered across the llanos and canyonlands added an element of danger to their version of free enterprise. The Comancheros were also trailblazers, cutting paths across the plains that were later followed, fatefully for the Comanches, by the U.S. Army and early day settlers and ranchers. The Comancheros’ sales territory extended from their native New Mexico east to the Wichita Mountains of Oklahoma and as far east and south as the Davis Mountains. That turf was opened up with an 1786 treaty between Juan Baptista de Anza, the Spanish governor of New Mexico who had dramatically scored a couple of rare but decisive military defeats of the Comanche in Colorado. The treaty allowed trade between New Mexico and the Comanches in exchange for protection of the Spanish territories and thus created a market the adventurous businessmen known as Comancheros were quick to exploit; the most amazing thing about the treaty was that both sides actually observed it. The trade worked like this. The Comanches would bring cows, horses, hides and captives to a predetermined meeting point. The Comancheros would take those commodities, including the captives, off the Comanches’ hands, and trade them guns, firewater, trinkets, whatever. A lot of times the Comanchero served as a middle man in returning the captives over to the Army, especially after an announcement by U.S. Army General Zachary Taylor that the government would pay for any captives brought in to Fort Gibson (in what is now eastern Oklahoma). The announcement had an unintended result: the number of captives skyrocketed and the market for them boomed. In time, the trade came to include guns, ammunition and whiskey and more than a few head of stolen cattle and horses. The Comancheros sold these to wily merchants who often sold the livestock back to the original owners. The beginning of the end for the Comancheros came when Colonel Ranald Mackenzie, with orders to exterminate the last band of wild Comanches (or any other tribe for that matter) found an old Comanchero trail that ran from present-day Tucumcari, New Mexico to what is now Canyon, Texas on the edge of the Palo Duro. The trail was told to Mackenzie by a captured Comanchero, Polonio Ortiz, who was promptly transcripted into service by Mackenzie as a scout. When Quanah Parker and his warriors surrendered, marking the official end of the Comanches as lords and warriors of the plains, the Comancheros lost one half of their business equation and faded into history as a sidebar or footnote, and not always in a good way. Many of the old Comanchero trails and the ones credited to Mackenzie and his soldiers are still in existence, though there is virtually no trace of the old Comanchero culture to be found anywhere. The old trails now are generally paved and are marked on maps as highways and county roads. It’s almost like the scant legacy of the Comancheros is part of the deal they made with history – to do their business, leave little behind and then move out of the way. The bulk of their lasting legacy is that they kept up their end of the deal.